We are your source for vacation rentals in Greenville, SC and Travelers Rest near Furman University with our six other properties Swamp Rabbit Lodge and Swamp Rabbit Urban Townhouses! Each of our properties accommodate different size groups but are all furnished in IKEA and have the same level of amenities we offer in all our properties. Great for groups, weddings, events and meetings too. Great for large gatherings! Cyclists haven! Hideaway for your band with lots of privacy. Set back on 15 acres on a working organic farm. Close to Furman University, Bon Secours Arena and Peace Center. Plenty of parking for tour buses and trailers. Pet friendly, this 5 bedroom mid-century modern ranch is just a 1/4 mile from the Swamp Rabbit Trail, a 19 mile paved bike/running trail, that is 1.5 miles from downtown Travelers Rest or 7 miles from downtown Greenville, SC. Great place to launch for the best cycling and mountain biking in the Upstate. This property is just outside the north gate of Furman University and at the base of Paris Mountain. 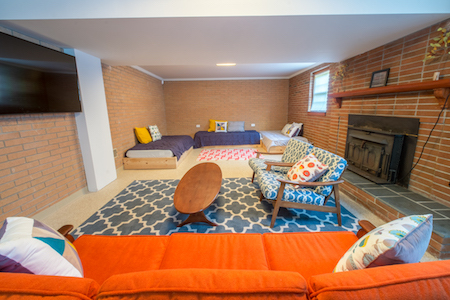 Come bike, hike and explore the area in this fun and funky Jetson’s themed lodge. Great outdoor spaces including a deck, hot tub and grill and .7 mile mountain bike/nature trail and bonfire pit on the property. Individual rooms can be rented as well (Judy, Elroy, Jane and Cosmic Lounge) Handicap accessible room is the the Judy room with hall bath and roll in shower, accessible parking and roll in deck. See below for individual rooms. Book an individual room in the Swamp Rabbit Lodge. 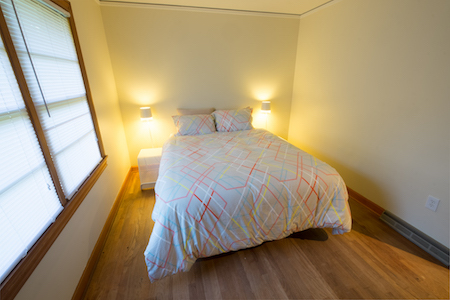 The Judy Room has a queen bed, private bathroom with shower, TV, Kuerig and a twin daybed with twin trundle. Access to community kitchen, decks with hot tub. Easy access to Furman University and Swamp Rabbit Trail and Paris Mountain State Park. Stay on a working farm. Sleeps 4. Starting at $80/night. 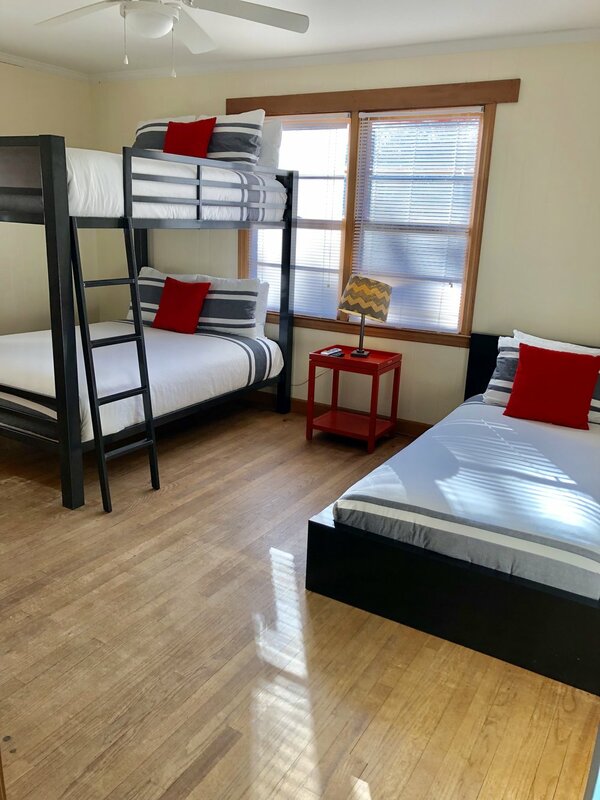 The Elroy Room has a bunk bed with two full size mattresses and a twin bed, private bathroom with shower stall, TV, Kuerig and access to community kitchen, outdoor decks and hot tub. Sleeps 3-5. Starting at $80/night. The Jane Room has a queen size bed and a dresser. This is a handicap accessible room and shares the accessible hall bath with roll in shower. Access to living room, community kitchen, outdoor decks and hot tub. Sleeps 2. Nightly rates start at $70. The Cosmic Lounge has three twin beds, lounge area, ping pong table, private outdoor access, and a TV. Located in the walkout basement of the Swamp Rabbit Lodge. Hall bathrooms upstairs. Access to community kitchen, outdoor decks and hot tub. Starts at $80/night. Question about a property? Ask using the form below! *This form is for questions only. Please book using the corresponding button next to the property of interest. Thank you!